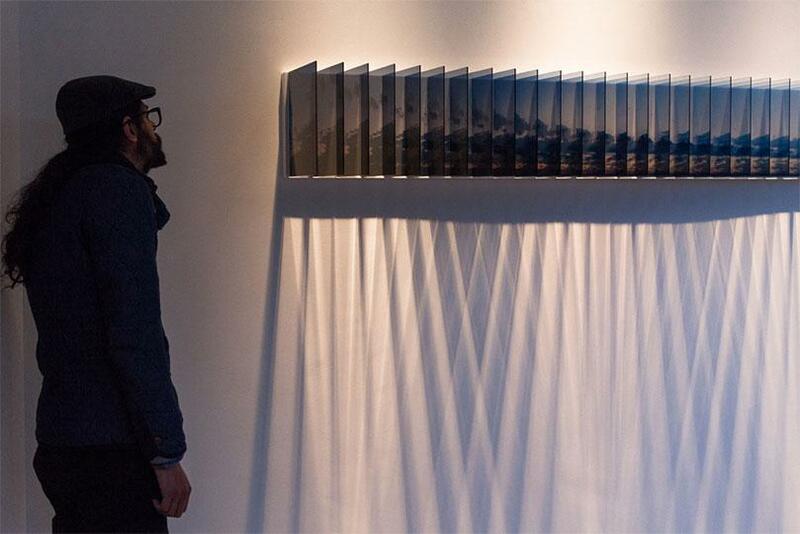 ‘Eclipse’ is the first solo show by the Japanese artist Nobuhiro Nakanishi in Belgium. This small exhibition of twelve works at Gallery Lot 10 is formed of two parts, and leaves an indelible impression. In one part are displayed ‘Strip Drawings’ made with pencil on paper; in the other ‘Layer Drawings’ of photographs on acrylic glass. Both parts are crafted with a similar philosophy and layering technique, yet they are very different in outcome. 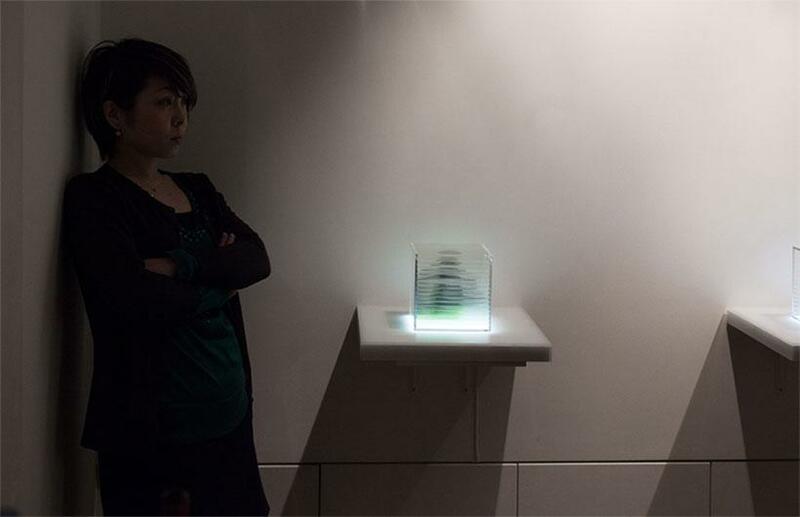 Trained as a sculptor, Nakanishi’s work is about materialising phenomena such as time, movement and space. The ‘Strip Drawings’ are made from left to right, and are reminiscent of the movement of printers. Small vertical pencil strokes, quite close to each other, are drawn with a steady hand on paper. 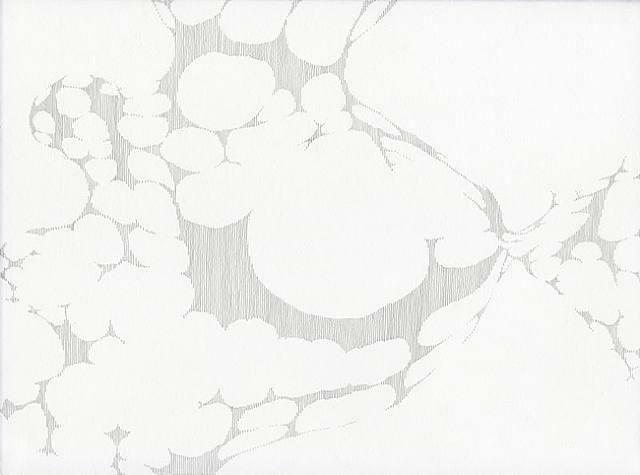 By deliberately leaving parts blank, the areas between the lines open, and Nakanishi creates the illusion of space. By doing so, a game between positive and negative elements opens up. Is it the pencil lines that are the main element in this work, or more the white forms and void spaces between them’ It leaves one dazzled as with an optical illusion. 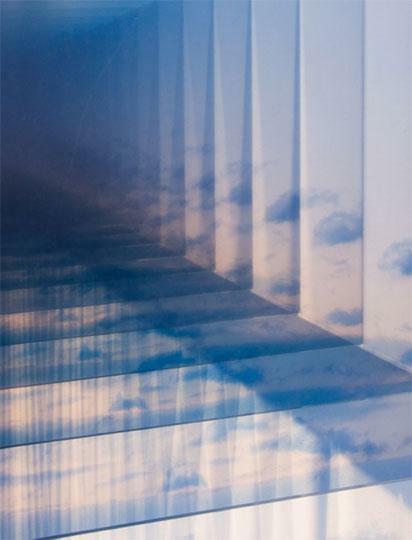 The ‘Layer Drawings’ create the impression of time passing, and are made up out of glass sheets of varying sizes. 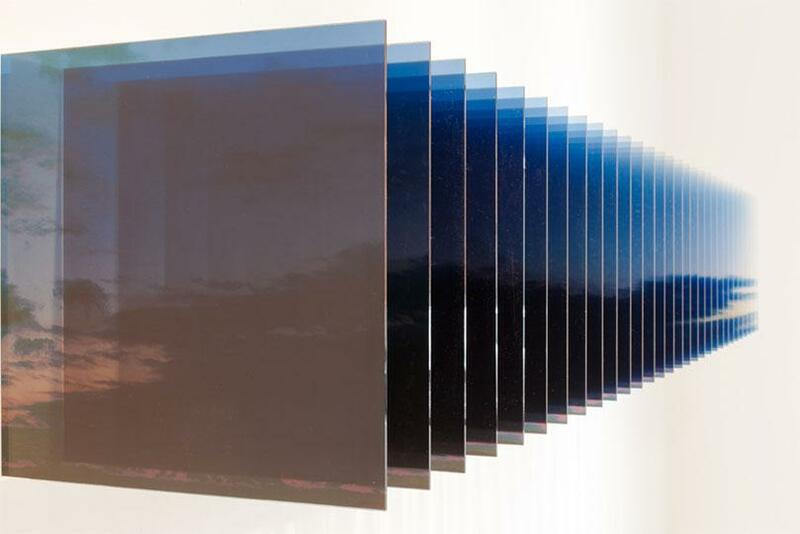 On them we see all kinds of photographs, made with several time intervals. We see ink on a tissue, drifting clouds, melting ice cream, sunrise, burning paper, falling leafs. 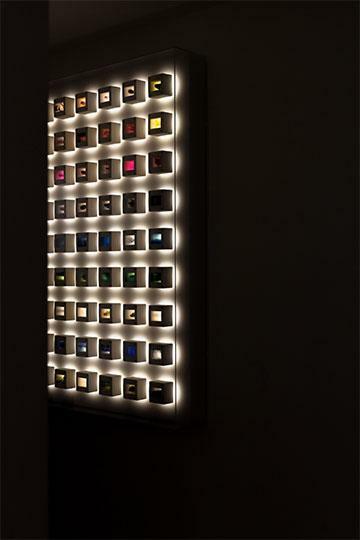 Some works are placed horizontally on a light-box to be viewed from above; others hang vertically behind each other at eye level. 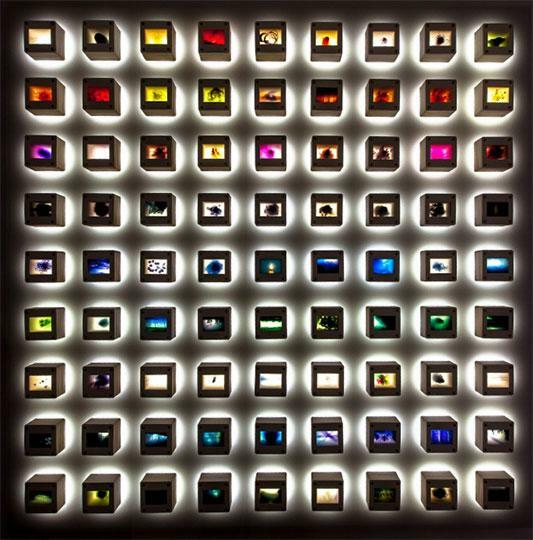 Bent over a pile of classic slide frames, we stare into a little colourful universe of time. These smallest ‘Layer Drawings’ are suggestive of studying a particular subject in detail under a microscope. To see in close-up an intact egg-yolk on the first slide, that is gradually running out in the next slides feels like watching a science documentary slowly releasing its plot. The larger 10x10cm ‘Layer Drawings’ on the contrary, which we see more from the side than from above, give the intriguing perception of being holographic sculptures. 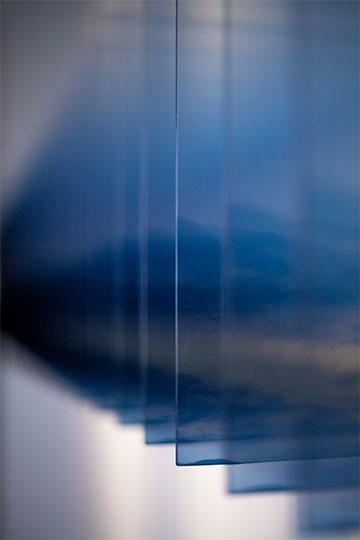 The blue, yellow and green photographs seem layer after layer to melt together in 3D semi-transparent forms, locked in a glass box. 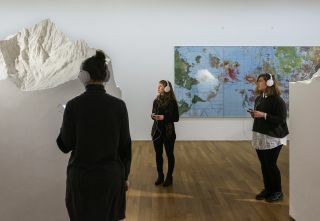 The most engaging work in the exhibition is however the largest ‘Layer Drawing’. 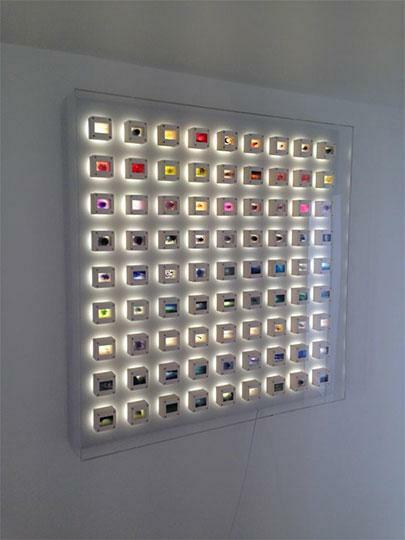 It is made from sequences of acrylic glass, and hung vertically in the gallery space, showing a sundown step by step. Yet to unlock the story, this artwork subtly demands the viewer to walk past it. Only by the movements of our bodies, our very own performance, can we can see the clouds floating slowly across the plates. In ‘Eclipse’, minimal art is never far away. This exhibition reminds strongly of the drawings of Sol LeWitt or the objects of Donald Judd, including the surrounding space in the artwork, and influencing our movements in the gallery. It forces the audience to use their entire body as an organ to perceive. 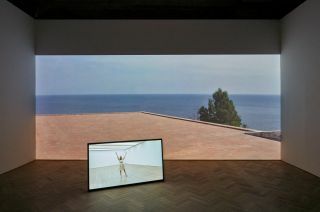 By doing so, Nakanishi’s work gives a robust answer to the question how pure images can be given back their physical dimension in the exhibition space. The engaging message and distilled and hushed Japanese style makes this work even more intriguing.